Arteco's Event Analytics is an intelligence-based platform that improves, simplifies and enhances event management by applying an additional layer of intelligent monitoring to video surveillance and business intelligence applications. Using a web-based platform, Arteco Event Analytics helps users determine valuable data from non-critical information. It drives new levels of intelligence-building through reporting of alarm events to streamline video monitoring while aiding in improving processes within an organization. Event Analytics delivers the ability to monitor, analyze and compare the health status of connected system and devices for fast and effective diagnosis. 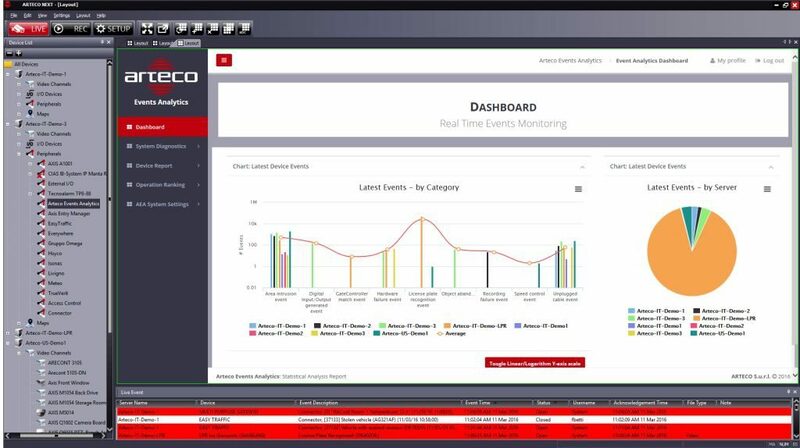 With an intuitive, visually driven interface, Arteco Event Analytics enables users to easily view, create and export data on security events to drive more efficient investigations, and proactive monitoring and response. Additionally, a reporting tool provides the ability to analyze and compare all the events generated by an installed device. This information can be used to further optimize operations and coordination of efforts for stronger security protocols and more effective incident management. Arteco Event Analytics is a powerful and flexible solution that can interface to a single system as well as a large number of servers across multiple sites. Arteco Event Analytics can be used directly on Arteco NEXT, or via smart devices to ensure enterprise mobility.